I must have written, deleted and rewritten today's post a half dozen times as I debated whether to blog about such a personal project. As many of you know I lost my Mom to the ravages of Alzheimer's Disease on November 15th and the holidays have been especially difficult for our family this year. I felt the need to honor Mom's memory with a meaningful tribute that not only would be cherished this holiday season but for many to come. 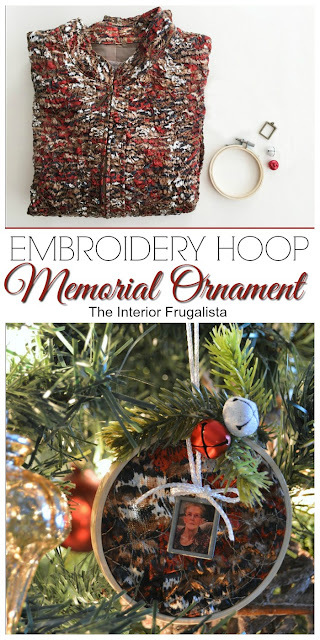 And so using the jacket Mom wore last Christmas, I made Embroidery Hoop Memorial Ornaments for my siblings and the grandchildren. I have to thank Denise from My Thrifty House blog for the inspiration for my memorial ornaments after seeing her Embroidery Hoop Plaid Ornaments post. 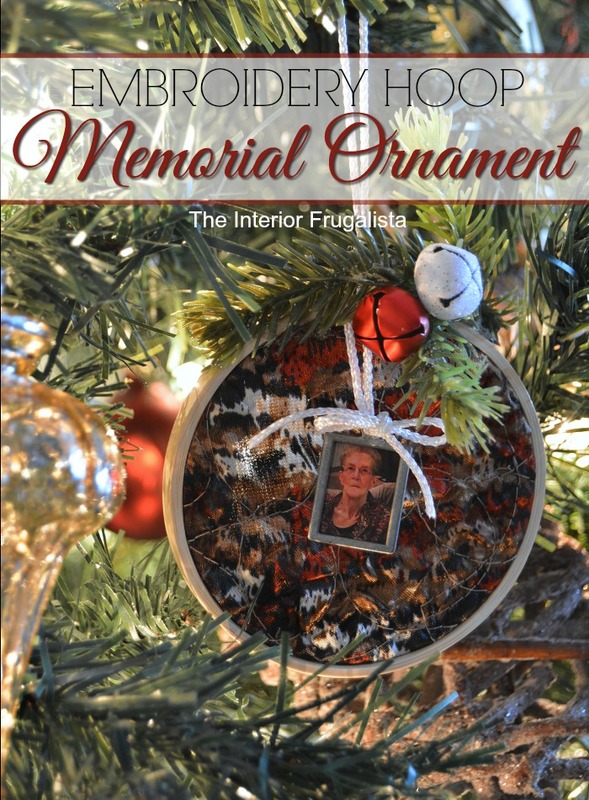 I decided to pay that inspiration forward by sharing my memorial ornaments in hopes that it too will inspire others to create something special out of a piece of clothing, a blanket, or linens inherited from a loved one who has passed. 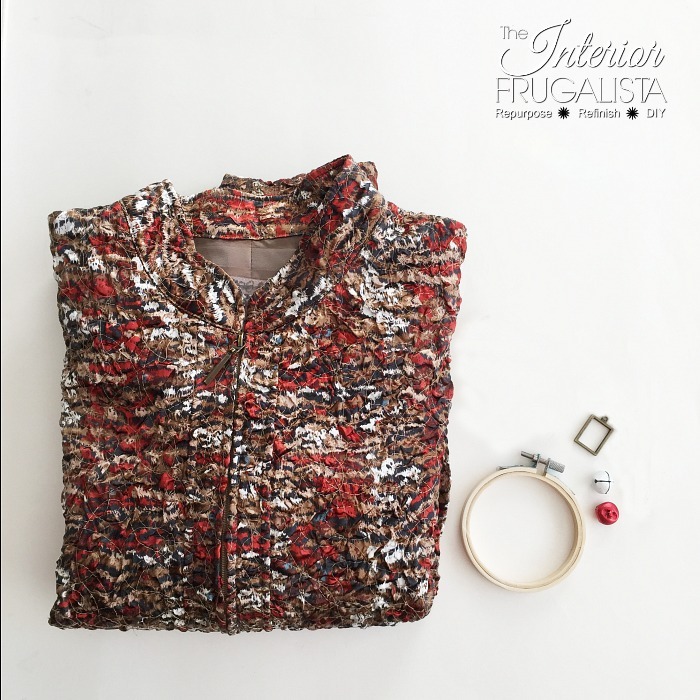 When we packed Mom's clothes for donation, I went through her closet to keep some of her favorite blouses. When I saw the jacket, it just had to come home with me to turn into something special. In the photo above are some of the materials I used to make the ornament. I've included a Materials List towards the bottom of this post for your convenience. I managed to get enough fabric from the jacket sleeves to make all eleven embroidery hoop ornaments. What you will need is a 3-inch embroidery hoop. What I quickly learned was these were hard to come by where I live, especially during the holidays. Every store was sold out. 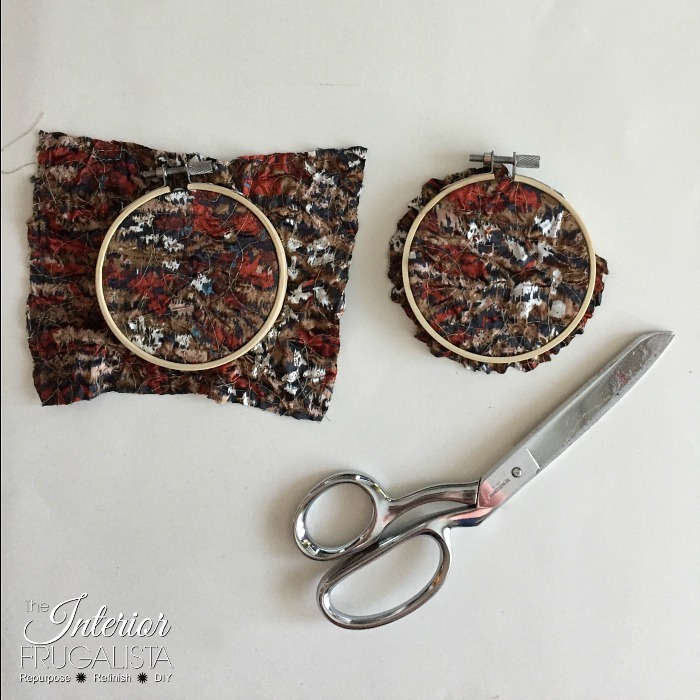 Cut the fabric in a square approximately 1-inch larger than the hoop. I should mention that the Singer sewing scissors pictured below were my Mothers. I think of her hunched over her sewing machine when I was a child every time I use them. 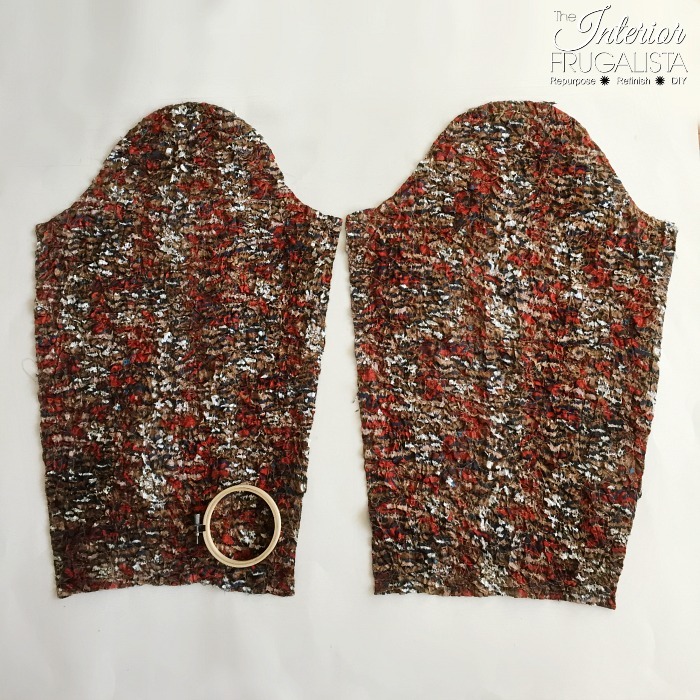 Place the inner ring under the fabric and stretch the fabric with the outer ring, tightening the allied gridlock screw. Trim the excess fabric, leaving enough to fold over the backside of the embroidery hoop. Flip the embroidery hoop over and hot glue the excess fabric around the wooden embroidery hoop frame as pictured below. I left the wood embroidery hoop frames natural because they pulled the light brown color in the fabric of her jacket. Unfortunately, I couldn't find a picture from last Christmas of her wearing the jacket where she was facing the camera while smiling. I found many with her turned towards people smiling. Using a color laser printer on the wallet size setting, to fit the 2"x3" metal photo frames, print the photo on glossy photo paper. 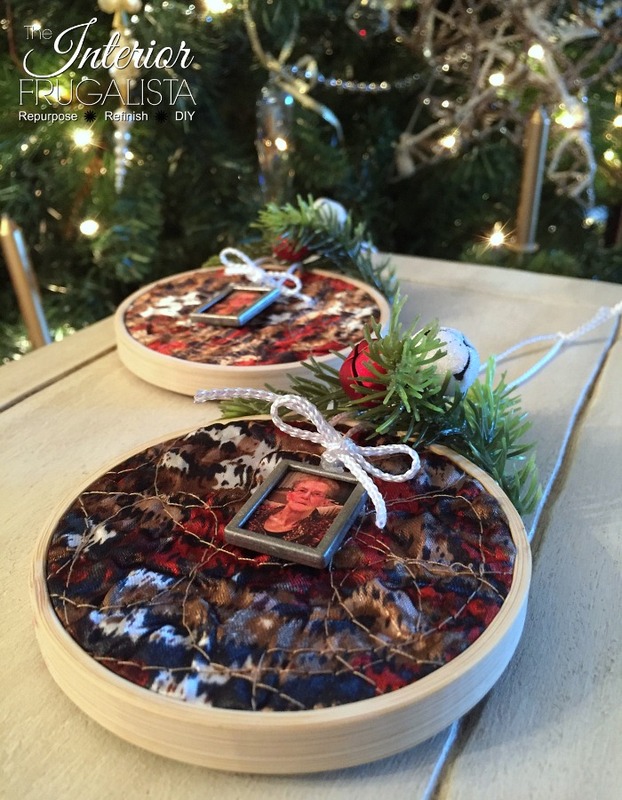 Insert into the photo frame and hang from the embroidery hoop with white satin jewelry cording. 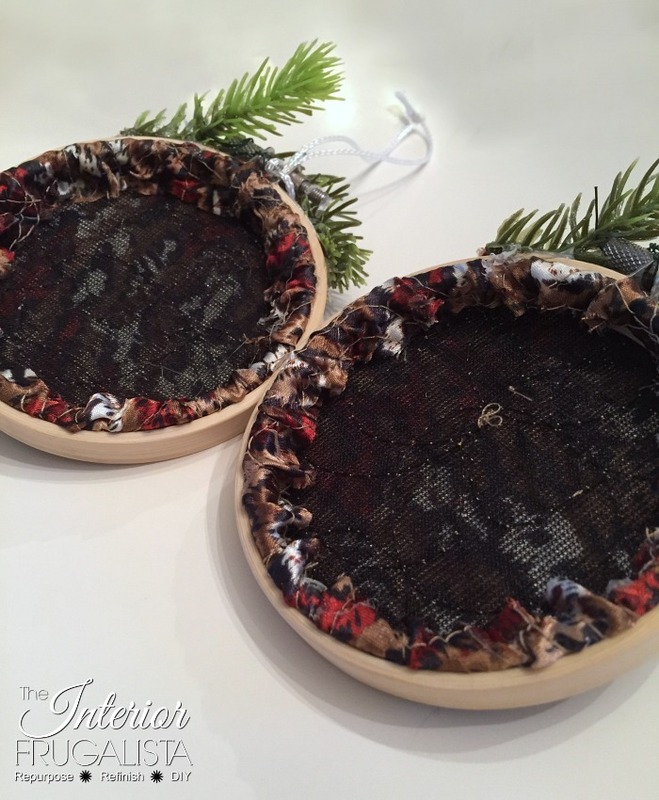 Next, I cut the greens from a small wreath and hot glued them onto the top of the embroidery hoops. Slip green florist wire through the tops of small red and white jingle bells and attach them to the embroidery hoop. 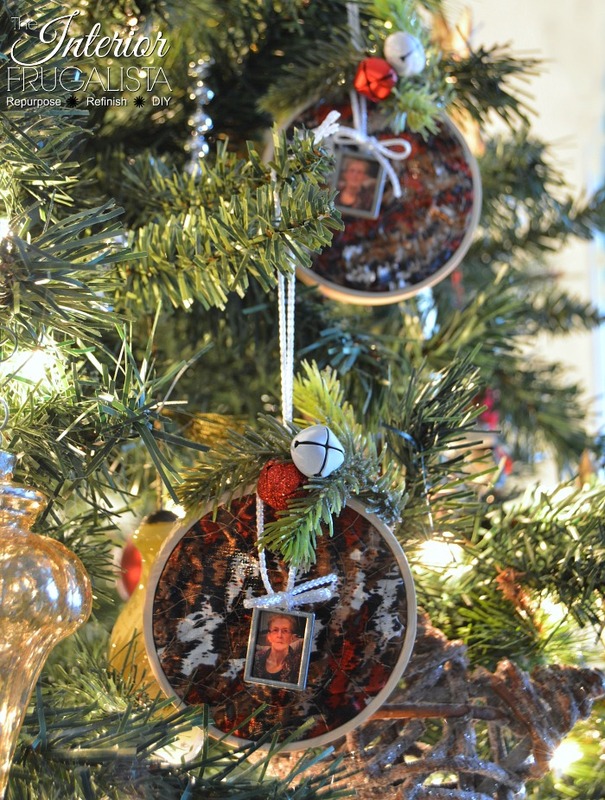 For the ornament hanger, slipknot a strand of white satin cording around the gridlock screw and tie in a knot at the top. 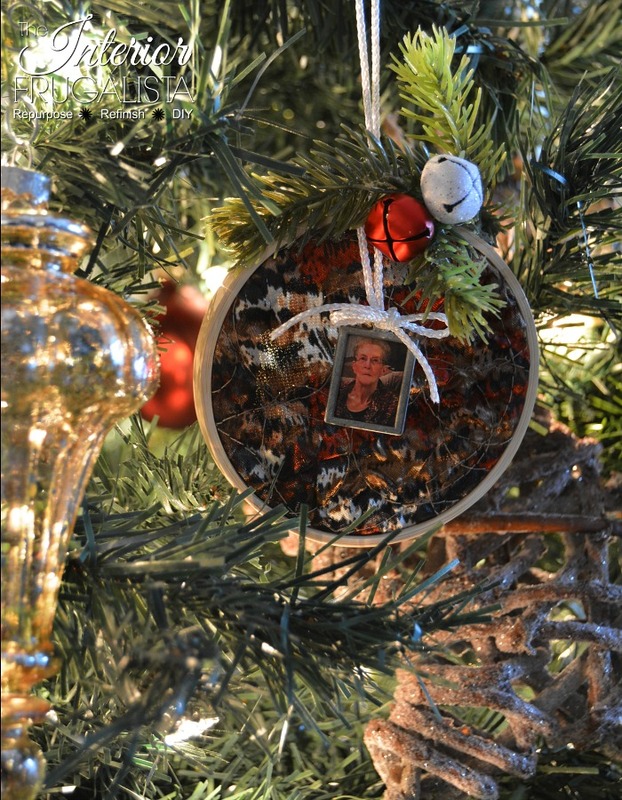 I hope you found my Embroidery Hoop Memorial Ornament using Mom's jacket inspiring. 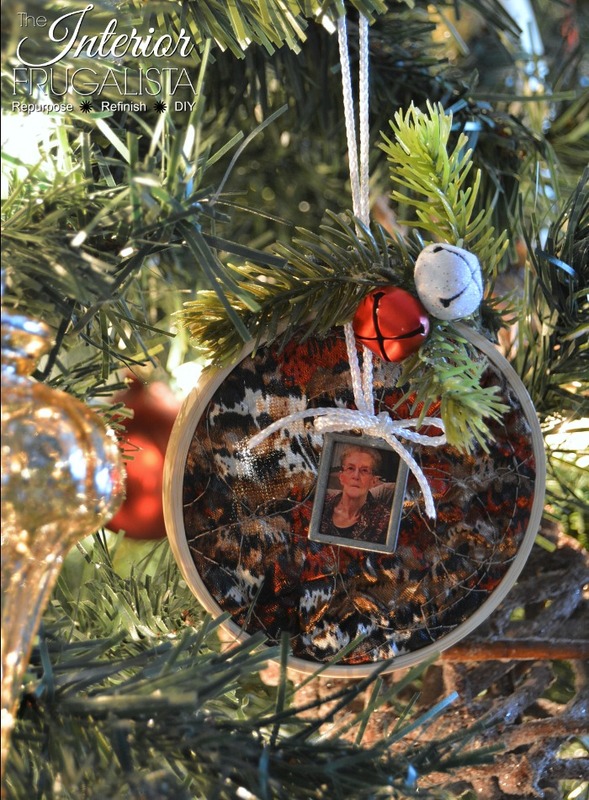 Perhaps you know someone who has recently lost a loved one who may find this just the idea they were looking for to honor their loved one during the holidays. If so please save on Pinterest and/or share it with a friend. Here is another way I honored my Mom in the Mom's Stool Got A Befitting Makeover post. This was a stool you could always find Mom on in the kitchen while doing dishes and peeling potatoes for her family of nine. Hold on tight to those you love this holiday season. What I would do for another Sunday afternoon spent holding Mom's hand while looking out the front windows of her care facility.